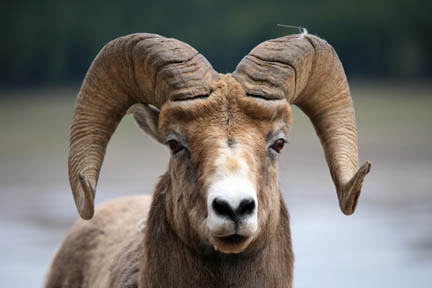 Radium Hot Springs is one of the most reliable places in the Canadian Rockies to view bighorn sheep. The Columbia Valley (also known as the Rocky Mountain Trench) has been carved over millions of years by the Columbia River. From its headwaters south of Radium Hot Springs, the Columbia flows northward through a 180-kilometer-long (110-mile-long) wetland to Golden, continuing north for a similar distance before reversing course and flowing south into the United States. The wetland between Radium and Golden holds international significance, not only for its size (26,000 hectares/64,250 acres), but also for the sheer concentration of wildlife it supports. More than 100 species of birds live among the sedges, grasses, dogwoods, and black cottonwoods surrounding the convoluted banks of the Columbia. Of special interest are blue herons in large numbers and ospreys in one of the world’s highest concentrations. The wetland also lies along the Pacific Flyway, so particularly large numbers of ducks, Canada geese, and other migratory birds gather here in spring and autumn.